"A welcoming hotch-potch of stories, poetry and jokes threaded through with carolling and wassailing, both acapella and accompanied by a proper bagful of instruments, blown, plucked, bowed and struck. The show is rich in the variety tradition - there are various nods to music hall - and steeped in folk's past and present, and the way the show veers effortlessly between solemnity and silliness makes it a wonderful and wonderfully warm, winter night out." 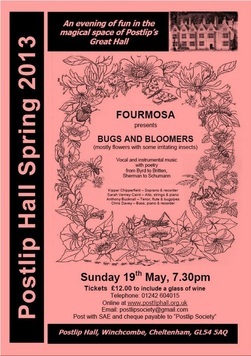 For your delectation and delight, we’re pleased to welcome Fourmosa back to Postlip Hall in their fifth season. 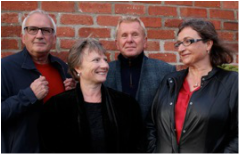 An evening of entertainment, classical and light-hearted music.